Returned to Bollington after 19 years away! 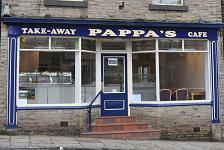 Pappa provides takeaway and café food with a Greek flavour. Also traditional fish and chips and burgers if you prefer!